Jamie Chatfield spent 4 years training at Rycotewood College in the late 80’s and on graduating was employed for 9 years by Colin Piper Conservation. He eventually took over the successful business from Colin developing it further whilst continuing to provide the highest levels of expertise to this day. 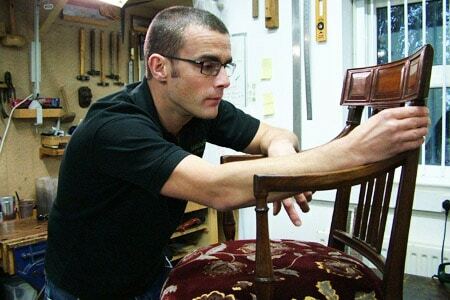 As a brief interlude, Jamie was asked to take on the role of Assistant tutor on the the Post Graduate Diploma in Furniture Conservation at West Dean College, West Sussex. He helped train and guide many students before turning his full time efforts back to his business in Oxfordshire. His successful company is now located near Brackley, Northants. Chatfield Furniture Conservation has a very diverse mix of clients. Over the years, Jamie has developed very strong relationships with many of the Oxford Colleges, privately owned historic houses and discerning collectors of fine furniture and of course, families and individuals who’ve inherited treasured items. For the colleges we look after large sets of chairs, large dining tables, cabinets, desks, student furniture and so on. Privately owned historic houses have vast collections of beautiful objects most of which we work on and if we don’t have the in house skills then we know who will be able to offer the expertise we require. Many clients just pop in with a bedroom chair or a Victorian work box that needs a little TLC. We will give all objects the same care and attention without prejudice.